Pro Bowling is the boss microgame found in the Cute Cuts stage in WarioWare: Touched! and also appears as Young Cricket and Master Mantis' boss microgame in WarioWare Gold. 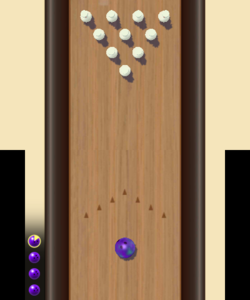 The objective of the game is to use the stylus to swipe the ball up across the bottom screen to roll it at the bowling pins to knock them down. In WarioWare: Touched!, the player gets three bowling balls to win. The player must score seven points or more to clear the microgame. In WarioWare Gold, the player gets four bowling balls to win. The player must knock down all pins to clear the microgame. 1st level difficulty: There is a normal bowling pin setup. 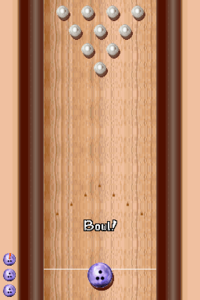 2nd level difficulty: There is a peculiar bowling setup. 3rd level difficulty: There is a peculiar bowling setup, arranged in a more difficult pattern. This page was last edited on April 10, 2019, at 14:32.